A miniature State of Malta - one of the most popular tourist destinations in Europe. Mediterranean mild climate, high quality of life, a variety of possibilities for a luxury holiday or a successful business development - only a small part of the reasons why many people buy real estate in Malta. And if you add to all this that the economy of Malta - one of the most developed and stable, the attractiveness of the country's housing market is understandable. 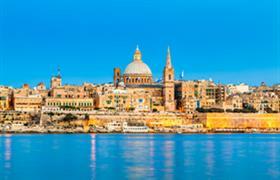 The name "Malta" is in the ancient Phoenician language and translates as a "harbor" or "shelter". The property market in Malta is indeed very attractive for those who want to protect their capital. The quiet Maltese harbor could resist even the global financial crisis, and now, thanks to this, attracts millions of investments in the country real estate market. After all, there is a special program in Malta for individual investors, giving them the right to obtain citizenship after investing in the economy of the country, or in luxury housing. Among wealthy buyers - lovers of luxury holidays and life – at a high rate of interest are houses and villas on the sea in Malta. In addition, the most powerful people in the world prefer commercial facilities and housing in the capital Valletta. But real estate in resorts and in the capital - not just a measure of prestige, but a long-term, secure investment in liquid estate, which gives confidence in the future. Lodging prices in Malta are slowly, but steadily growing, and with it grows the welfare of the owners. Almost all the population in Malta has their own homes. A large part of foreign buyers, in spite of obtaining a residence permit or citizenship, acquire not residential, but so-called holiday homes. But this holiday house on the sea can be a reliable source of high additional income. Of course, locals are not going to rent the property, but the number of tenants among tourists, who want to spend a holiday in a luxurious private home, but not in a hotel, is very large.